Hennepin County Medical Center is dealing with a spike in patients who accidentally overdosed on what authorities believe is the synthetic drug known as K2. Forty-two people have been brought to HCMC since Wednesday. They were extremely agitated, somewhat aggressive and had elevated heart rates. Some were having seizures. 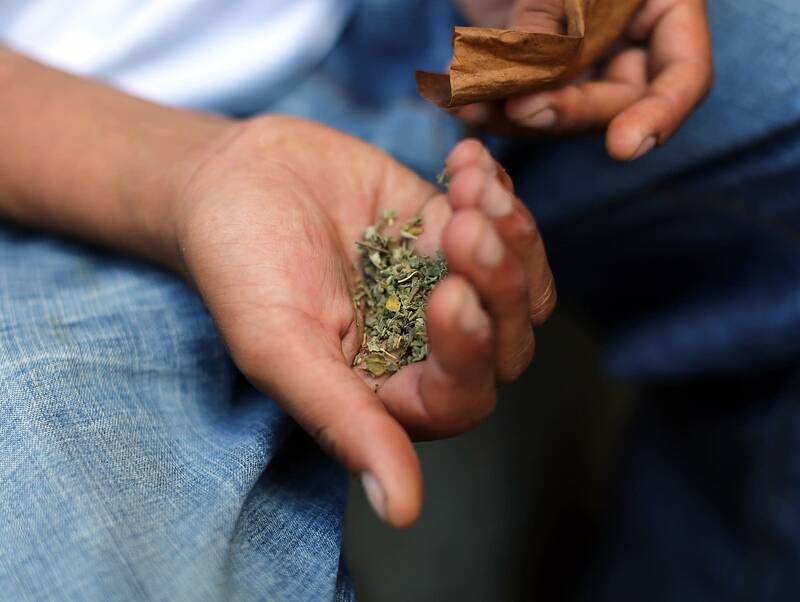 The victims believed they took K2, although "the people who buy it, use it and sell it often don't even really know what it is," said Dr. Jon Cole, medical director of the Minnesota Poison Control System, based at Hennepin County Medical Center. K2 was initially created in research labs to mimic the active ingredients in marijuana. The idea was that these research chemicals would become drugs to treat wasting syndrome from HIV and cancer, and treat nausea and vomiting associated with chemotherapy, Cole said. The chemical compounds, though, also became a favorite of drug dealers. In the late 2000s K2, also known as "Spice," started showing up in head shops where it was sold as an "herbal incense blend." Minnesota outlawed synthetic drugs in 2011, but they can still be found in some head shops and on the street. Some people buy it because they think it's stronger and cheaper than regular marijuana. Others think it will allow them to pass a drug test while using. Cole said K2 is typically manufactured as a liquid which is then sprayed on plant matter. But reactions to it vary dramatically between people. This week's overdose victims came into HCMC aggressive and agitated, but Cole said a different recipe can produce completely different symptoms. One batch might cause heart attacks, while another induces comas. "You're depending on the quality control of a guy in an illicit lab somewhere, how long he's holding the chemical sprayer on the junk plant material," said Cole. "That's the gamble you're taking when you take this stuff." Cole said if a patient overdoses on the synthetic opioid fentanyl, he can give them the antidote Narcan. But with K2, doctors can only treat the symptoms and wait for the drug to work its way out of the system. The worst part, he said, is that whenever medical experts figure out the drug's chemical makeup, the dealers change the formula, said Cole. This week's spike in K2 overdoses is not the first, locally. St. Paul saw a similar surge in May. In recent years, teenagers in Blaine and Woodbury died after overdosing on synthetic hallucinogens. "We have seen an onslaught of synthetic drugs over the past 10 years in this country, the likes of which we have never seen," said Twin Cities drug abuse expert Carol Falkowski. Illicit drugs are getting harder to regulate, she said. "We have a model system in this country of identifying chemicals that are being used as substances of abuse and adding them to the list of controlled substances," said Falkowski. "But the DEA (Drug Enforcement Agency), the federal agency responsible for that, is getting many different variations of controlled substances on a regular basis, so that model is very difficult to keep up with." Falkowski wants the DEA to come up with broader, more inclusive language, although she and Cole agree there will be no quick fixes to dealing with this new era of synthetic drugs. Editor's note: (Oct. 10, 2017): Dr. Cole's title was incomplete in an earlier version of this story. He is medical director of the Minnesota Poison Control System, based at HCMC.